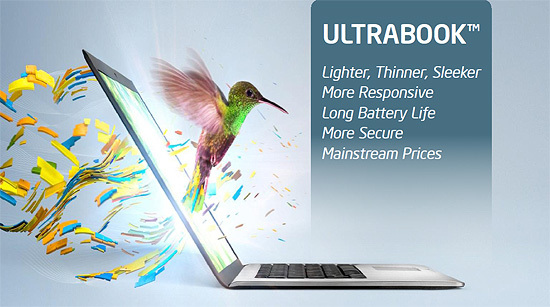 Intel came up with the term ‘Ultrabook’ to refer to a type of laptop that met certain feature and design criteria. The specific requirements needed to earn the designation ‘Ultrabook’ are aptly described in this laptopmag.com article, so I will merely summarize: An Ultrabook is a slim, Intel Core processor-powered laptop with strong battery life, quick wake-up from sleep, extra security features, and the fastest external ports for those wishing to use Lexar SD cards or external hard drives to supplement the solid state drives most Ultrabooks use. If some of these features sound similar those of a MacBook Air, they should. Ultrabooks are often thought of as copycats of Apple’s thin design. However, Ultrabooks generally cost less than similarly equipped MacBook Air models and have become quite popular with consumers who like the design but not the high price. As sales of Ultrabooks continue to increase while the overall laptop market struggles, one has to wonder what Ultrabooks are doing right in comparison to their heftier counterparts. The secret behind the success of Ultrabooks is twofold: style and portability. Few computer users want to be seen lugging around an enormous, ugly contraption that hogs up table space at coffee shops or business meetings. Ultrabooks are truly beautiful machines that compliment the style of the user much like a sleek attache case would. They look smart and impressive wherever they are found, and laptop users who are willing to fork over big bucks for a computer don’t want their machines to look cheap. The portability of Ultrabooks is second to none in the laptop world, so those laptop users who used to haul their computers in backpacks or massive satchels can ditch those heavy encumbrances for something lighter and easier to carry. Sure, many Ultrabook users carry around an external hard drive, but these are very compact nowadays and only minimally affect portability. Are Ultrabooks Worth the Extra Money? When compared spec for spec, Ultrabooks are definitely more expensive than their beefier brethren. This is simply because the technology required to get the same processing power and components into a thinner chassis costs more. For those who put a premium on their laptop being stylish, light, and fast, Ultrabooks are good option if you have the money. If you want something more full-featured with, say, a big internal hard drive and an optical drive (most Ultrabooks do not have optical drives), an Ultrabook simply won’t do. What Is the Future of Ultrabooks? Ultrabooks look to have continued growth in the laptop market over at least the next few years. A short blurb from the Intel Newsroom proclaims that the company has engineered a chassis that is made of plastic and will be both stronger and less expensive than current Ultrabook models. When these cheaper Ultrabooks hit the market, possibly next year, expect the sales of Ultrabooks to skyrocket. Everyone will be wanting these slender, speedy laptops aside from perhaps mobile gamers, who will likely to continue to need bigger machines for some time. With their design elegance and portability, Ultrabooks have grabbed a segment of the laptop market and seem poised to only to increase in popularity. Ultrabooks are definitely here to stay for the foreseeable future.